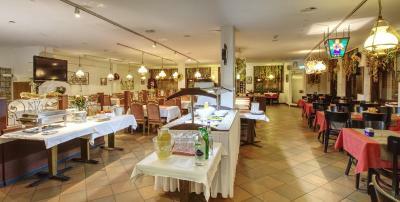 Lock in a great price for Hotel Rheinfelderhof – rated 8.1 by recent guests! Staff where very helpful. Room very spacious. Perfect location. Location was quiet, with a 5-10 minute walk to the Basel Kunstmuseum. 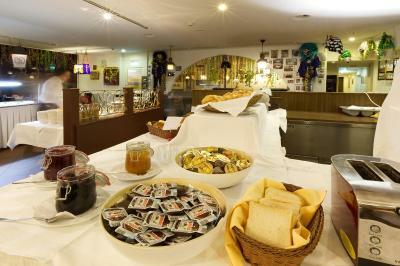 Clean room, very helpful staff and the breakfast was good. I'd stay there again. Location. The hotel is situated very near the Roche tower 1, which helps. As its situated bang in the middle its near everything. Will come back there for sure. It's a very utilitarian place that is exactly what it appears. The staff did their best with what they had, and we honestly kind of knew this wasn't going to be 5-star accommodations. 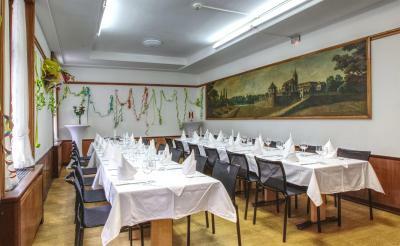 The location was great, centrally located in Basel. They are within walking distance to the cheapest parking in town. Their breakfast was fantastic! I can sit there for hours. I wish American coffee were available. 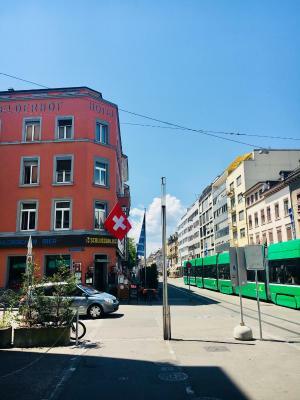 Location is great , room is very clean , breakfast is good ,check-in at any time reception is open 24 h.
Location was perfect and staff very helpful.Loved that the tram stop was right in front of the hotel. 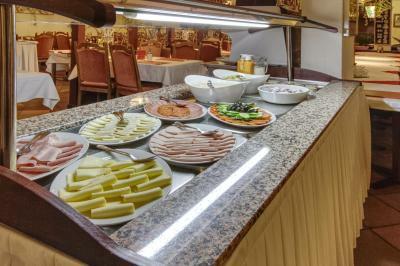 Not expecting breakfast with the room rate - breakfast was delightful. 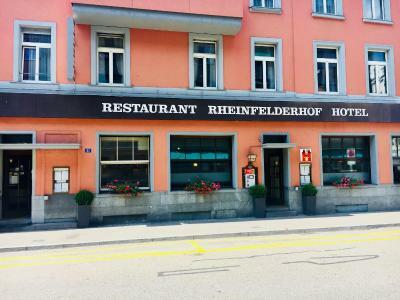 Hotel Rheinfelderhof This rating is a reflection of how the property compares to the industry standard when it comes to price, facilities and services available. It's based on a self-evaluation by the property. Use this rating to help choose your stay! 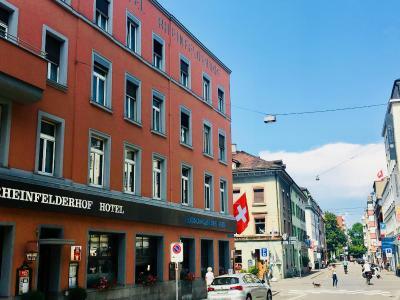 One of our top picks in Basel.The Rheinfelderhof hotel enjoys a central location in Basel, 650 feet from the trade fair and 3 minutes' walk from the city center. A tram stop can be found in front of the hotel. 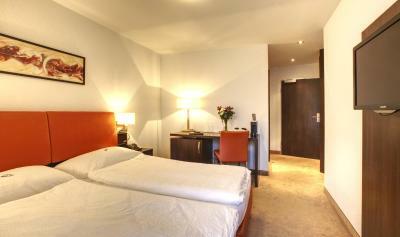 All rooms come with satellite TV and free WiFi and consist of a private bathroom. Some rooms are soundproofed. 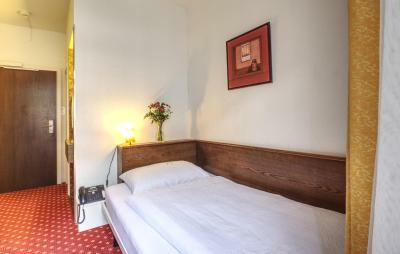 Clara is a great choice for travelers interested in convenient public transportation, atmosphere and sightseeing. 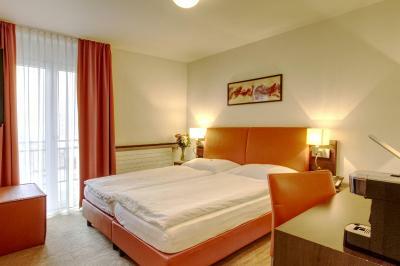 When would you like to stay at Hotel Rheinfelderhof? Private parking is available at a location nearby (reservation is needed) and costs CHF 25 per day. This soundproof room has a satellite TV and a minibar. 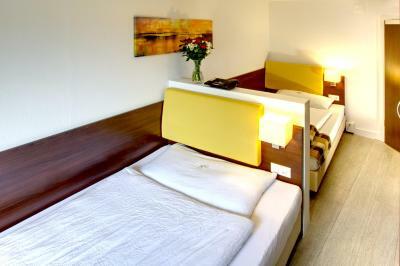 This large, soundproof room features a satellite TV and a minibar. Hotel surroundings – This neighborhood is a great choice for travelers interested in convenient public transportation, atmosphere and sightseeing – Check location Great location - show map Guests loved walking around the neighborhood! 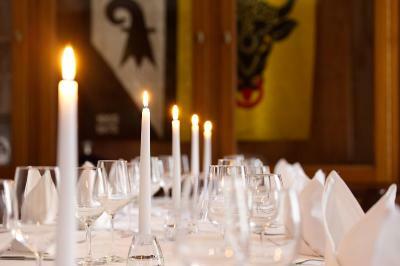 House Rules Hotel Rheinfelderhof takes special requests – add in the next step! Hotel Rheinfelderhof accepts these cards and reserves the right to temporarily hold an amount prior to arrival. 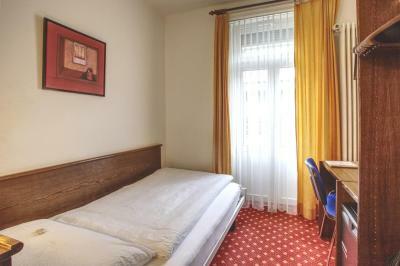 The booking confirmation serves as a public transportation ticket on the day of arrival, from the railway station SBB or Badischer Bahnhof or from the EuroAirport to the hotel. 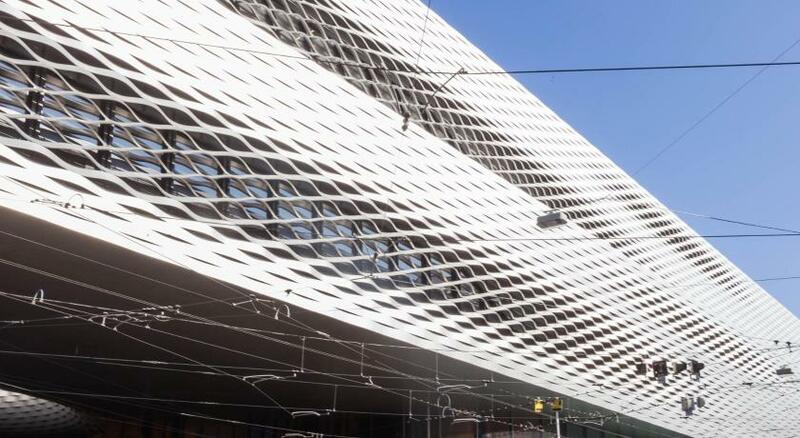 Upon request, guests can receive an access code for all public Wi-Fi spots in Basel. Our check-in was confusing. The person at the desk was not forthcoming with information. For instance, if you asked "Please, where's the parking garage? ", he'd respond "It's there", pointing at another street. No specifics — not where exactly, or how to drive there. You had to prompt him for more information. "Can I park in the spot in front of the hotel just to get the bags out?" "It's not ours", and a shrug. The sort of thing that frustrates you when you're tired and have a sleepy 5 year-old as a travel companion. Soraia, who tended the reception during the day, was very warm and accommodating to our needs. 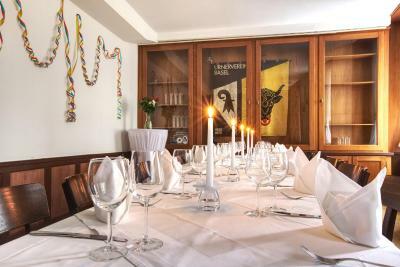 The location is very good — near the tram, and within very walkable distance to the Marktplatz and other parts of the city center. 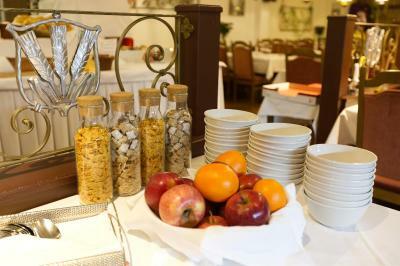 The breakfast is great — make sure to enjoy it if you're scared of Swiss prices. Very clean, friendly staff, very nice bathroom. Bed comfy enough. Stayed in budget single room, was surprisingly good. Really needs an update. The carpet was very stained, but you could tell the staff tried their best to keep things clean. The bathroom was clean and adequate. The restaurant was mediocre and food very greasy. Friendly staff, clean hotel. 10-15 minutes walk to city centre. Tram stop in front of the hotel. The water flashed outside the bath,doors of bathtub are broken. Hostess did not tell us that time for breakfast ends in ten minutes and finishes at 11 o'clock and that we would not be served. Breakfast is poor. Very good location. 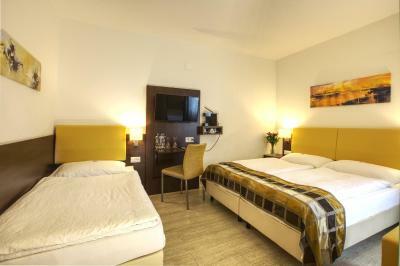 Compare to a 3 star hotel it is very well equipped. 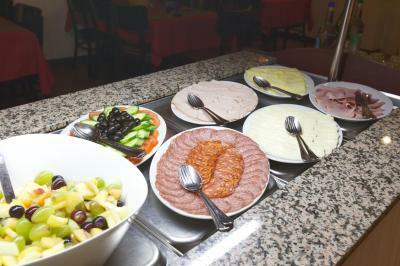 The bed was very comfortable and the breakfast was amazing. They provided for us the Basel card which ensured free public transport usage. 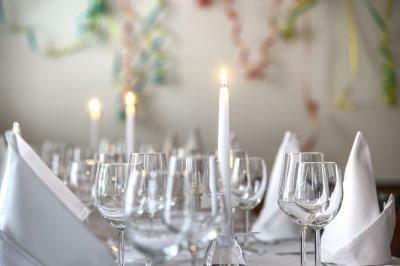 Their restaurant’s menu has a wide variety of delicious meals. We were totally satisfied with our stay. A fridge would have been nice. 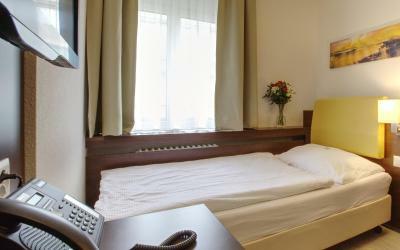 A bit on the pricey side for a single room but that's with everything here. Everything was alright. The free city card is always good to have for taking the public transport and visiting attractions. The room felt a bit too warm despite turning down the radiator, woke up at night to open the window but it's facing onto a street so can be a bit noisy early in the morning. 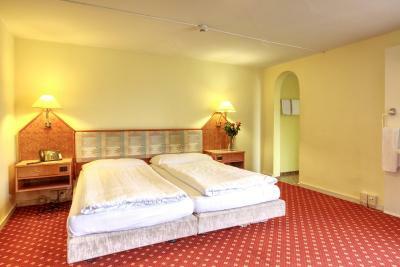 Good quality hotel, deserves 3 stars, good value for money. 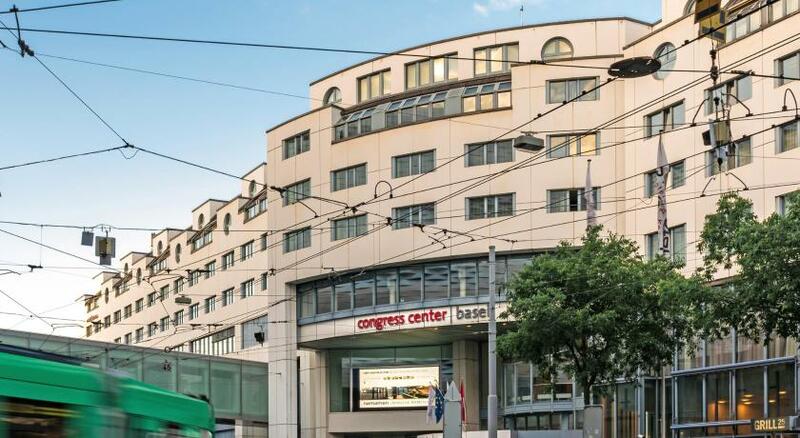 They give you the Basel card for free so it's worth arriving at the hotel as soon as you get to the city and then use the card instead of buying tickets etc.